The U.S. stock market’s own price action suggests that the stock market will continue to rally for another year. Various studies of the stock market’s breadth have been bearish. They’ve pointed to a “bear market” or “big correction” very soon. Some of these have been the Hindenburg Omen. So which of these 2 market studies is right? Which is more important? Price action or breadth? The Medium-Long Term Model remains bullish on the U.S. stock market. 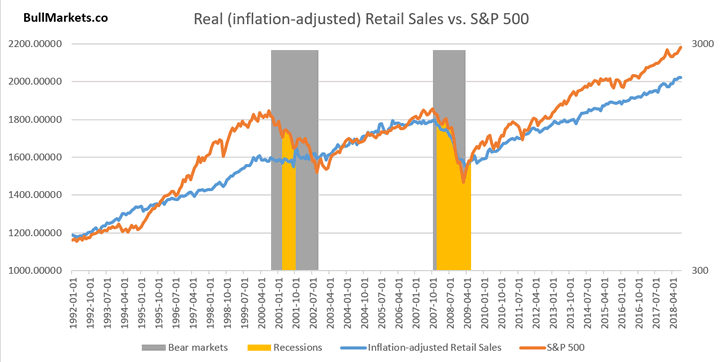 Since the economy and stock market move in the same direction in the long term, leading economic indicators are also leading stocks market indicators. Leading U.S. economic indicators continue to improve, which suggests that the bull market in U.S. stocks isn’t over. Initial Claims and Continued Claims continue to make new lows for this economic expansion. While Housing Starts & Building Permits have fallen a little recently, the main trend is still upwards. Meanwhile, Freight Transportation Services and inflation-adjusted Retail Sales continue to trend upwards. The stock market’s own price action is bullish while breadth has become bearish (e.g. Hindenburg Omen). For starters, the stock market has rallied in a slow and steady manner. This usually results in a continuation of the uptrend. The stock market has been pretty strong this September. Historically, this is bullish for the S&P and Dow. Moreover, the Dow finally broke out to a new all-time high. 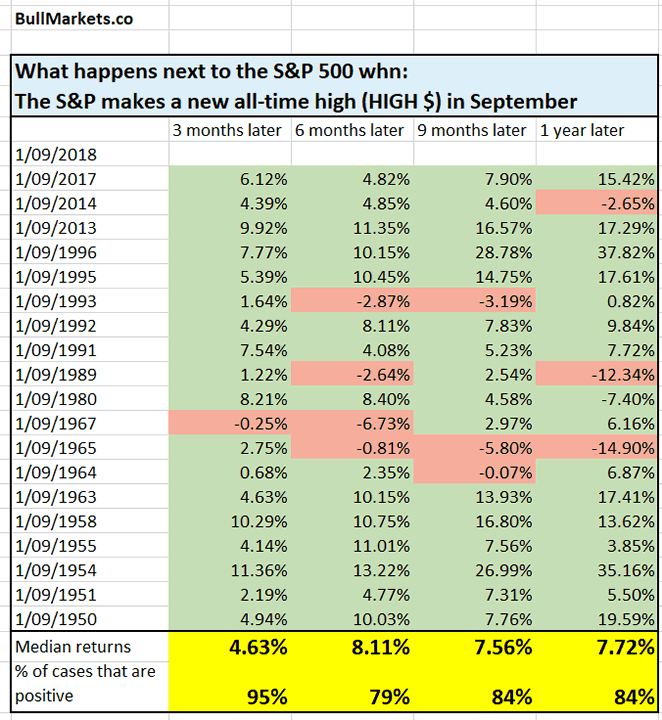 When this happens, the U.S. stock market (S&P 500) usually keeps going up. The U.S. stock market is currently experiencing sector rotation. Large caps lagged during the first half of this year while small caps and tech led. Now large caps are leading. Historically, this means that the stock market will either soar or crash over the next 1-2 years. There is no middle ground. 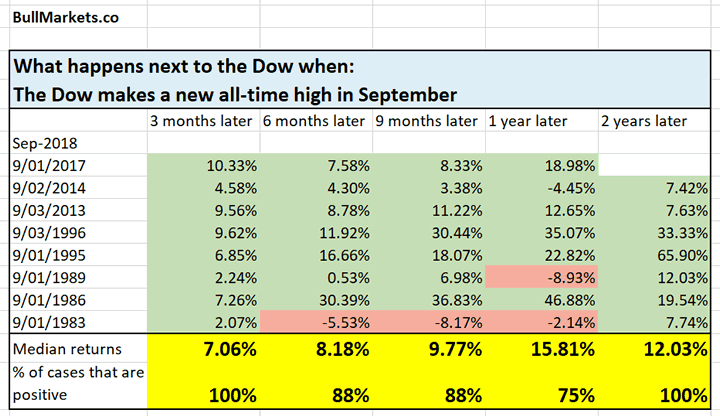 So as you can see, the U.S. stock market’s own price action points to continued gains over the next 6-12 months. 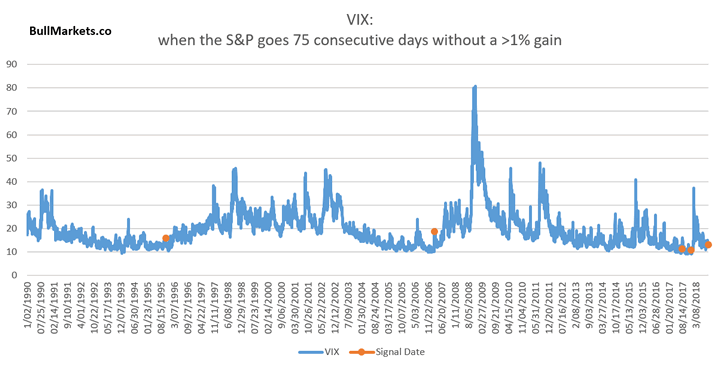 However, the stock market is likely to trend higher while volatility increases as well. The stock market’s bearish factors mostly come from breadth indicators (e.g. the Hindenburg Omen). Traders tend to focus too much on breadth confirmation. Historically, bearish breadth divergences can last for YEARS before the stock market actually makes a big decline. Using these breadth indicators is no better than a 50-50 coin toss. One of the biggest bearish worries recently has been the Hindenburg Omen. In reality, clusters of Hindenburg Omens have occurred repeatedly (and failed repeatedly) in the past. Sounds bearish, doesn’t this? 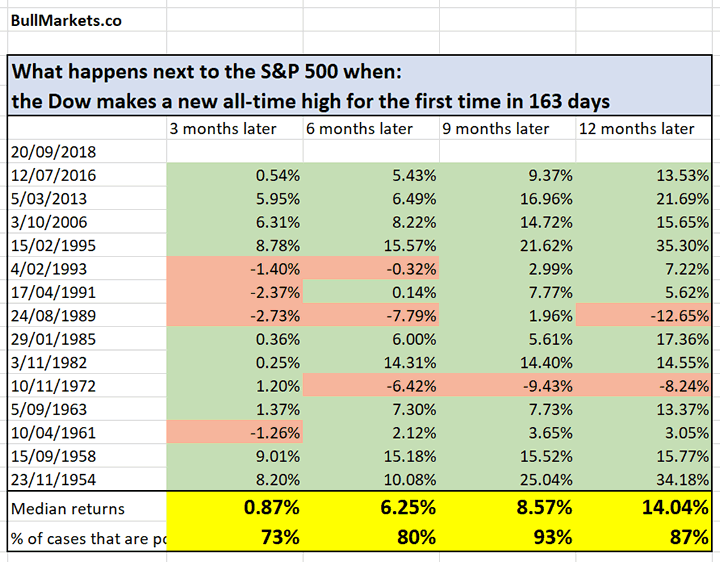 These historical signals occurred before a lot of major declines. Fact: the stock market soared after December 2016. FAILED cluster of Hindenburg Omens. 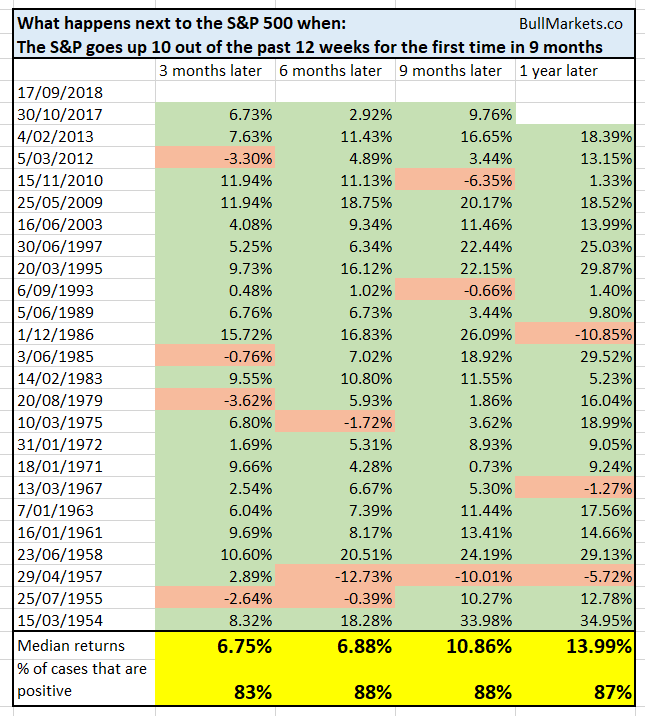 *The S&P made a “big correction” or bear market after all of these historical cases. Fact: the stock market soared after July 2017. FAILED cluster of Hindenburg Omens. Fact: the stock market soared after August 2017. FAILED cluster of Hindenburg Omens. Fact: the stock market rallied after November 2017. FAILED cluster of Hindenburg Omens. Need I continue? So why do breadth indicators like the Hindenburg Omen have so many false bearish signals? The Hindenburg Omen uses NYSE data. The NYSE has a lot of FOREIGN stocks. This does not accurately reflect the U.S. stock market. Divergences increasingly only reflect a divergence between U.S. and non-U.S. stocks. The Hindenburg Omen looks for >2.8% of stocks making 52 week highs and 52 week lows. 2.8% is a TINY number. It’s not saying that e.g. “30% of stocks are making 52 week highs and 30% of stocks are making 52 week lows”. From what I’ve seen over the years, the stock market’s own price action is more important than breadth. 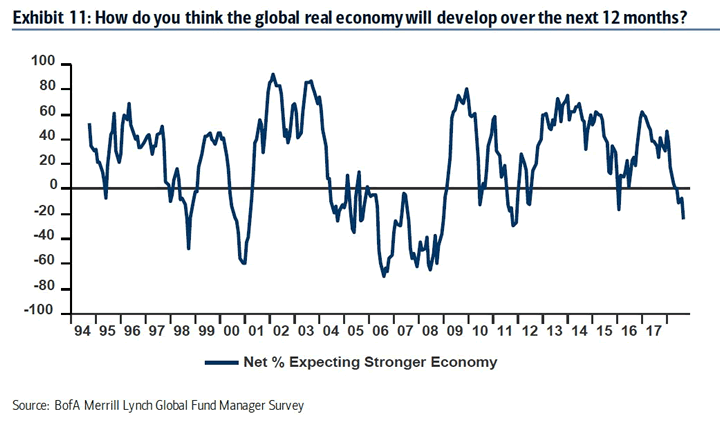 And lastly, Bank of America’s latest fund manager demonstrates that fund managers are the most pessimistic on the global economy since 2011. Considering that only 10% of active fund managers outperform the S&P 500, this is a bullish sign for U.S. stocks. Active fund managers are mostly a contrarian indicator. As you can see in the above chart, this level of bearishness DURING AN ECONOMIC EXPANSION (e.g. 1998, 2004-2006, 2011, 2016) marks a medium term buying opportunity. And with U.S. economic growth at 3-4%, a recession over the next 6-12 months is highly unlikely. The stock market’s medium term outlook remains bullish. The long term is still bullish, but we are watching out for deterioration in the economic data (which has not happened yet). Focus on the stock market’s own price action instead of breadth. Breadth indicators are of secondary importance. The short term is mostly a 50-50 bet.